On Saturday 16 January, the Cairo Symphony Orchestra's weekly concert will be joined by Ines Abdel Dayem on flute, Federico Mondelci on saxophone and the jazz trio – Mohamed Saleh on piano, Sherif Elian on double bass and Hesham Kamal on percussion. The Cairo Symphony Orchestra will be conducted by Mohamed Saad Basha. The evening will focus on jazz and Latin American music, including Gershwin's Cuban Overture, Bolling's Suite for Flute and Jazz Piano Trio (orchestral arrangement by Mohamed Saad Basha), Stefano Nanni's American Medley, Girotto's La Poesia, Morronga la milonga and Milhaud's Brazileira, Samba (from Scaramouche). Ines Abdel-Dayem is one of the best-known figures in Egypt’s cultural scene. She graduated from the flute department of the Cairo Conservatory and continued her studies in France, where she obtained a PhD from the Ecole Normale de Musique in Paris. She has held a number of leading positions in Egypt. In 2003 she was appointed director of the Cairo Symphony Orchestra and in 2005 she became dean of the Cairo Conservatoire and soon after that the vice-president of the Academy of Arts. 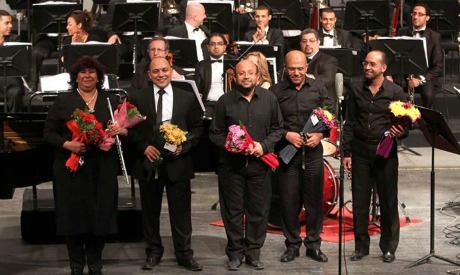 Since February 2012, Abdel-Dayem has been chairperson of the Cairo Opera House — the National Cultural Centre. Apart of her responsibilities as the Opera's chairperson, Abdel-Dayem continues to perform extensively with numerous ensembles and gives many recitals. Federico Mondelci is a graduate of the Conservatorio Statale di Musica ‘G. Rossini’ in Italy and then Bordeaux Conservatoire, France. Saxophonist, composer and conductor, Mondelci has established himself as one of the leading saxophonists of his generation. He has performed with numerous renowned orchestras and represented Italy in many international festivals. He also conducts many international ensembles and is a returning guest conductor of the St. Petersburg Philharmonic and the Bangkok Symphony Orchestra.